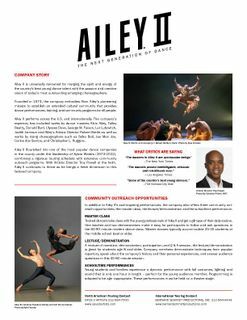 Every March, when NYC is deep in the winter blues, Ailey II's exciting season fires up at just the right moment. 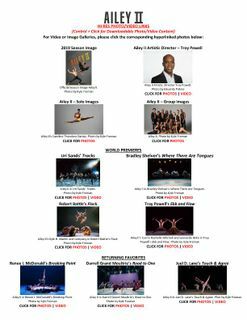 And this year is no different: They've got a roster of fiercely talented dancers, and a slew of premieres (as well as returning favorites) to boot. Dance Spirit caught up with Jessica Amber Pinkett, now in her second season with Ailey II, for a rundown on her rehearsals, pre-performance rituals, and more. The famed dancers perform "Rock My Soul in the Bosom of Abraham" live from Times Square. Dancers use strength and agility to make midair splits and elaborate lifts look effortless. Take it from these pros, who've mastered everything from ballet to break dancing, then try our flexibility workout to feel long and limber. Ailey II dancer Lloyd A. Boyd was a sophomore in high school when he found out he had scoliosis. In 2007, an instructor at his Summer Intensive program in Dayton, OH noticed his uneven back. Courtney Celeste Spears - Audra Danielle Noyes is a young designer, having made her way nearly straight from her studies at Savannah College of Art and Design to Paris, where she cut her teeth at Lanvin and John Galliano. And so her Spring précis was one no doubt informed by her own experiences, which delved deeply into the metamorphosis of a young woman. Courtney Celeste Spears - Every year, the Princess Grace Foundation honors a few lucky members of the arts community. Getting a Princess Grace Award (which comes with a generous grant) is like joining one of the most elite clubs around—a club that includes David Hallberg, Tiler Peck, Mike Minery, Gillian Murphy, Kyle Abraham, Drew Jacoby and Isabella Bolyston.